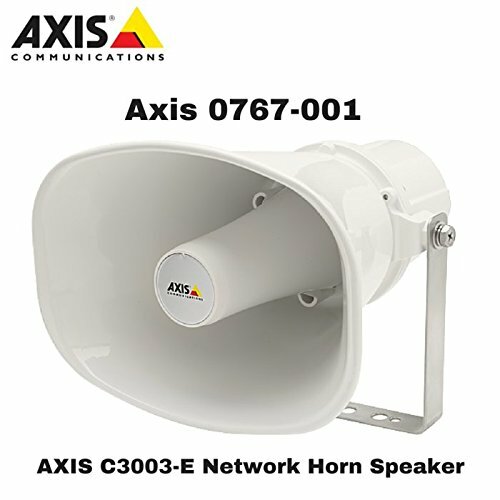 Axis c3003-e network Horn speaker is a simple-to-install outdoor loudspeaker that provides clear, long-range speech for remote speaking in video surveillance applications. In live video monitoring situations, axis c3003-e enables an operator to remotely address people and deter unwanted activity. The loudspeaker can also play a pre-recorded audio file when it is manually or automatically triggered in response to an alarm event. Axis c3003-e makes announcements possible from anywhere with network connectivity. It easily integrates with video management software (VMs) that support two-way audio and with Voice over IP (VoIP) telephony systems that use SIP (session initiation Protocol). the outdoor-ready axis c3003-e is easy to install on walls, ceilings and poles. The loudspeaker has a built-in amplifier and supports power over Ethernet (Poe). it Connects directly to an IP network with one network cable for communication and power. Despite its low power consumption, axis c3003-e enables a High sound pressure exceeding 121 db. Being a standalone unit, axis c3003-e can be placed anywhere, enabling a flexible, scalable and cost-effective approach to system design.